Our final day is a short one, with half of our group leaving after our first stop to make their flights. Adler Fels Winery in Sonoma was our first stop; perched on a mountain top, it had beautiful views of the valley below. 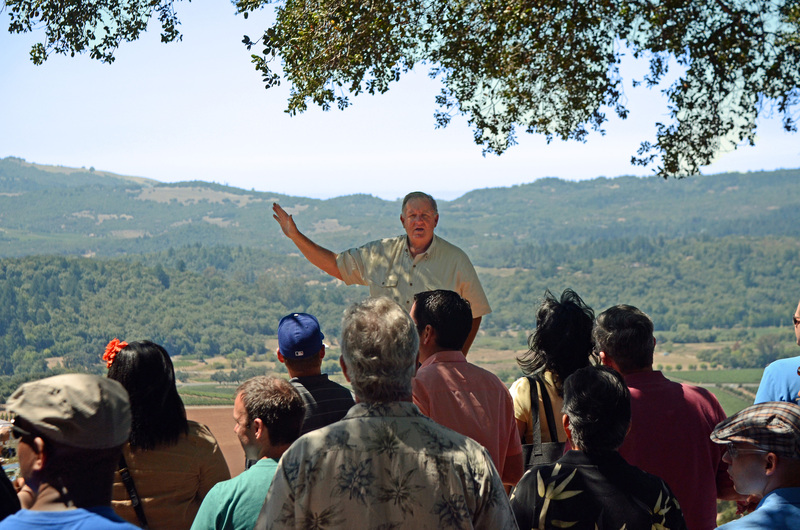 After a quick breakfast at the viewpoint, we separated into two groups – one for tasting and another for a tour of the winery. Adler Fels winemaker, Harry Parducci, Jr.
Adler Fels makes a good amount of wine for us aside from the Adler Fels Line. Some labels include Abbeyville, ­­­­­Kitchen Sink and Buffalo Grove, to name a few. Not all the wine is made here on the property since the winery is very small. They have much larger production facility off-site that is used to produce the majority of their labels. Adler Fels is unique; they don’t own a single vine! It’s really amazing how they have developed so many great relationships with growers over the years that have allowed them to access to great grapes, which in turn delivers to us great value-for-the-money wines! We had a chance to meet with Harry Parducci Jr., the winemaker for Adler Fels, as we tasted through his latest releases. Sadly, half of our group headed off to the San Francisco airport while my group went to the town of Sonoma to visit with the folks from Anaba Wines for our last tasting and education of the trip. 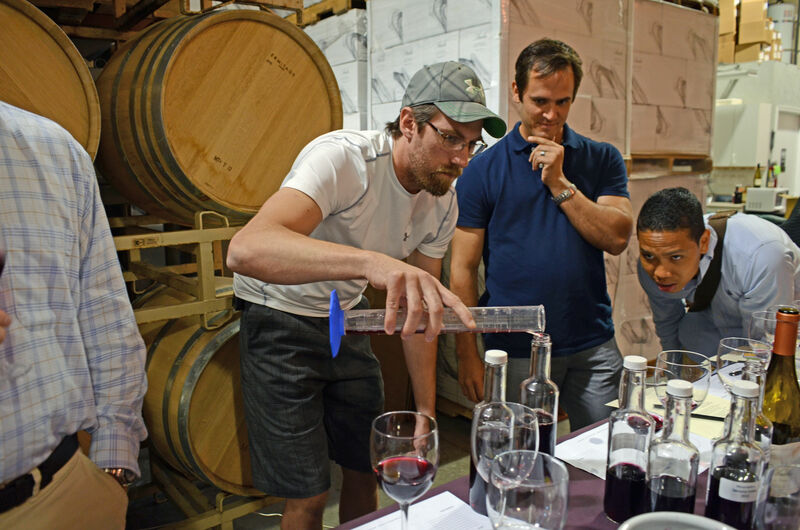 We walked into the winery and were surprised with a very fun exercise – we got to blend our own wine! There were four stations set up where we had Syrah, Grenache and Mourvèdre barrel samples to work with. Proprietor John Sweazey was on hand to get us started. Not only did we get to blend our own wine but we also had to come up with a name for it and tasting notes to help sell it. In the end, there were four winners – two tied for one of the categories. TONS of fun for the last stop! I’m so sad our trip over; I wish it could keep on going but unfortunately, we have to get back to our stores. A week that saw over 40 wineries, tasted over 350 wines and met countless wonderful, hospitable and passionate people in the wine business – there are many, many highlights. Each stop we encountered different personalities, different views on winemaking, and “secrets of the trade” that will all be shared with you in our stores throughout the next few years. I’m sure they’re already up in some locations but be sure to keep an eye out for pictures of the teams from each winery. For me, the trip was a very educational one, with the best memories of times spent with passionate owners and winemakers and gaining a deeper understanding their unique and distinctive wines. Day six of our California Wine Experience is underway! 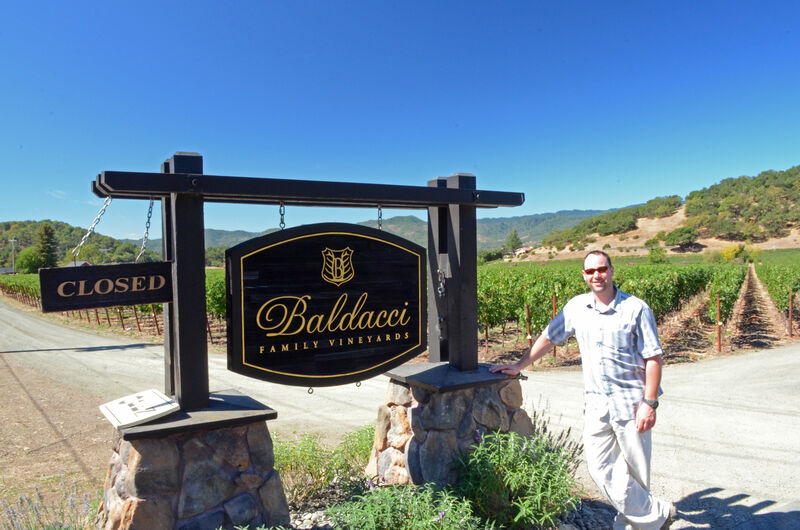 Our first stop was Baldacci Vineyards in the Stags Leap District of Napa Valley. This was a really educational stop; winemaker Rolando Herrera, vineyard manager Garret Oliver, and owner Tom Baldacci were on hand to share with us different facets of their business. Rolando took the group out into the vineyards where he had a table set up with three different clones of Cabernet Sauvignon for us to taste and compare. We also had the chance to use a refractometer to measure the sugar levels in the grapes – an indicator of whether the vineyard is ready to be picked. In the cellar, Rolando poured barrel samples and explained his philosophy on barrel aging Stags Leap District Cabernet. 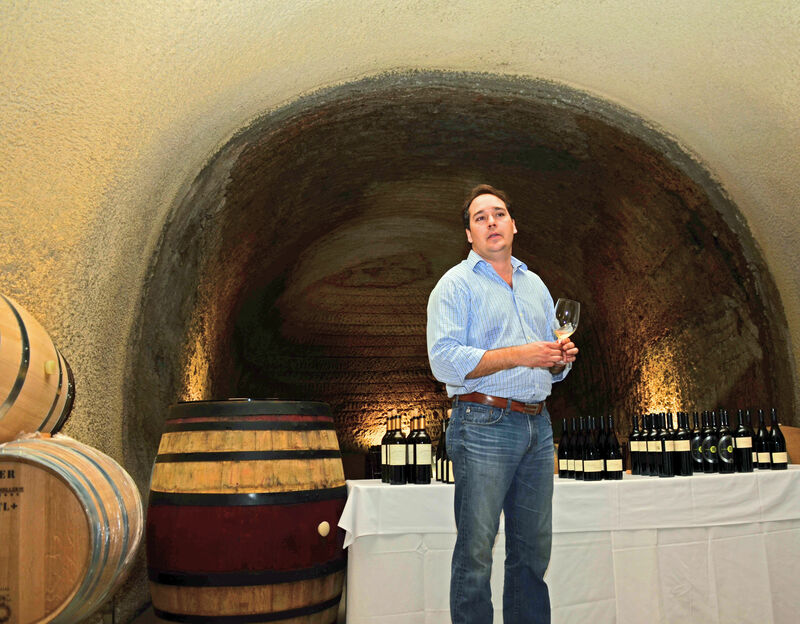 Finally, Tom Baldacci was around the corner in the caves pouring the finished wines – IV Sons, Stags Leap Cabernet and Brenda’s Vineyard Cabernet. Next stop was a unique visit with Piña Napa Valley – instead of going to the winery, they took us to the Wolff Vineyard off of State Lane in Yountville for a walk-about wine tasting. 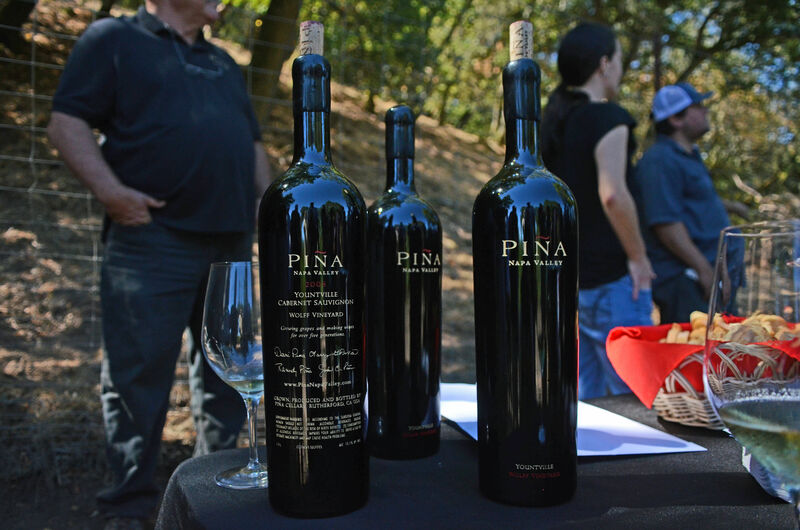 All of the Piña brothers, along with winemaker Anna Monticelli and assistant winemaker Macario Montoya were there to take us through the wines and the vineyard. A first for many of the team; we tasted a vertical of the Wolff Vineyard, vintages 2006 through 2012. What a treat! These were stellar wines and all slightly different reflecting the characteristics of the vintage. This was a tremendous learning experience. 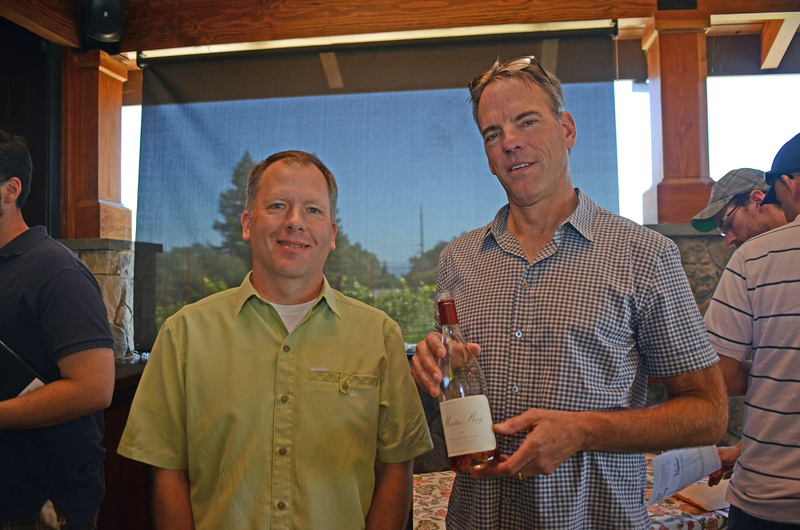 Now it’s on to lunch with brothers Philip and Eric Titus, owners of Titus Vineyards. Their winery is located on the Silverado Trail, just north of St Helena. 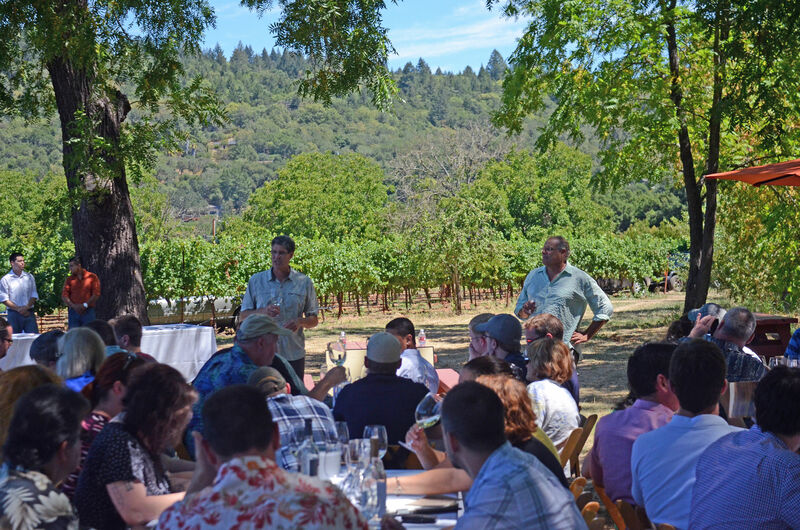 As we arrived, each of the brothers hopped on a bus and led us on a vineyard tour before heading to our lunch site, which was tucked away on the southwest corner of their vineyards. Most importantly, it was in the shade, it’s been very hot the past few days! The latest release of their Cabernet Sauvignon was excellent, along with the Sauvignon Blanc. There is a new project from them coming soon, so keep an eye out for those when you’re in our stores. A new stop this year was up next, the small-lot producer Chateau Boswell. Also located on the Silverado Trail in St Helena, it’s is a beautiful estate with some incredible caves, built to the owner’s green building specifications. Chateau Boswell has the distinction of being the first certified Napa Green Winery! 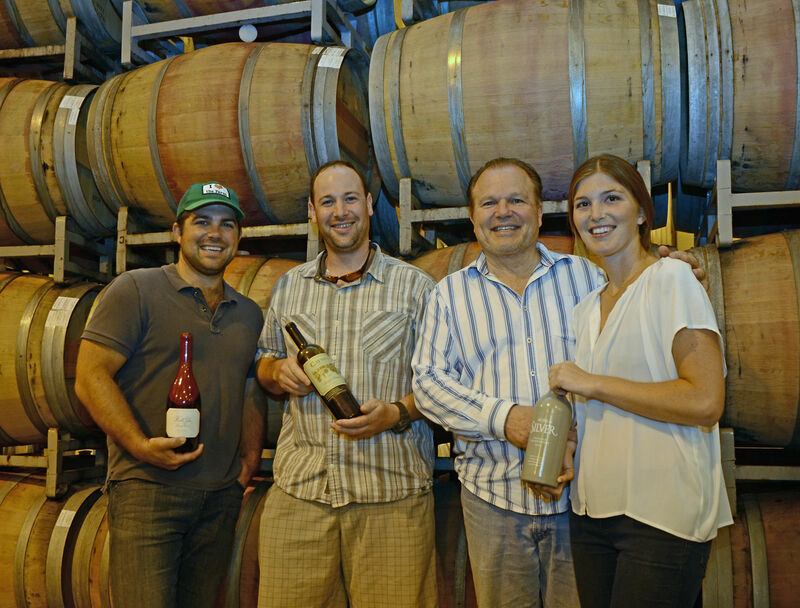 Russell Bevan is now their winemaker making both the Chateau Boswell wines, along with the Jacquelynn line of wines. 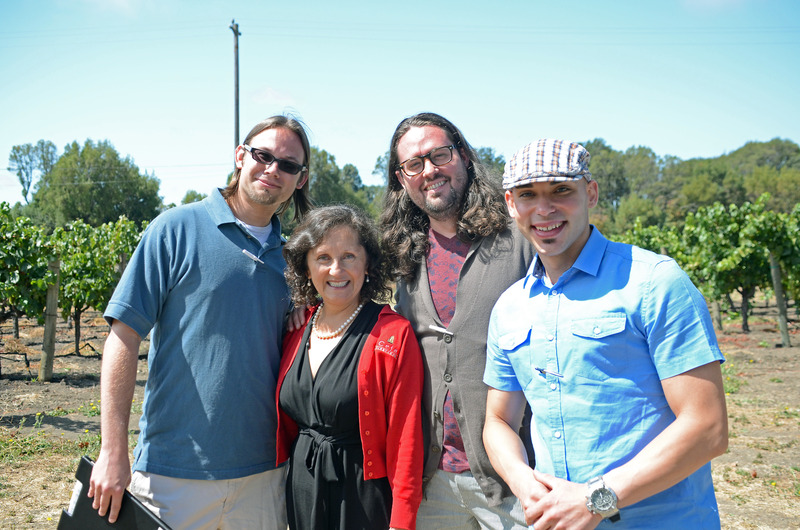 The tasting was held in the caves, hosted by Susan Boswell, Josh Peeples and Russell Bevan. It’s very unique for a Napa valley producer to be focusing on Chardonnay and Pinot Noir production, but that is their primary focus. They also make Cabernet; but from walking through the caves, you can see that the majority of the barrels are from Burgundy. It was my first time tasting these wines and when they hit the stores I’ll be picking up some of the Boswell Chardonnay for sure. Our final stop (and one of my favorite views of Napa Valley) was Chappellet Winery, perched atop Pritchard Hill. Pritchard Hill is considered the “high rent” district in Napa, there are some really tremendous wines coming from here. Chappellet’s neighbors include top producers like Bryant Family, Colgin, David Arthur and Ovid. In comparison, all of Chappellet’s wines are tremendous values. The family just built a new winery on the property, striving to be as energy efficient as possible. Several members of the Chappellet family were with us, along with winemaker Philip Titus, who we saw earlier in the day at his own winery, Titus Vineyards. We tasted the latest vintage of the Chappellet Signature Cabernet and their top wine, Chappellet Pritchard Hill Cabernet Sauvignon! After the tasting, we headed down to a meadow that featured incredible views of Lake Hennessey and the Napa Valley below us. Dinner was served and the Mexican cuisine was top notch, I’m a sucker for good chile rellenos! On the tables throughout dinner were other wines they produce, both Chappellet and Sonoma-Loeb. We savored the food, company, view and as the sun slowly set, we made our way back to the hotel. Our final day is tomorrow! If you’re like most of us wine lovers who tend to drink more white wine during summer months, this post is for you. Even though I consider myself more of a red wine drinker, I can’t resist seeking out new and exciting white wines when outside temperatures start rising. My name is Michael Gallo. I’m a wine manager at our Cary, North Carolina store. Let’s take a brief look at five fun and exciting wines that are a must-try before you take down the umbrella and bring in the chairs. 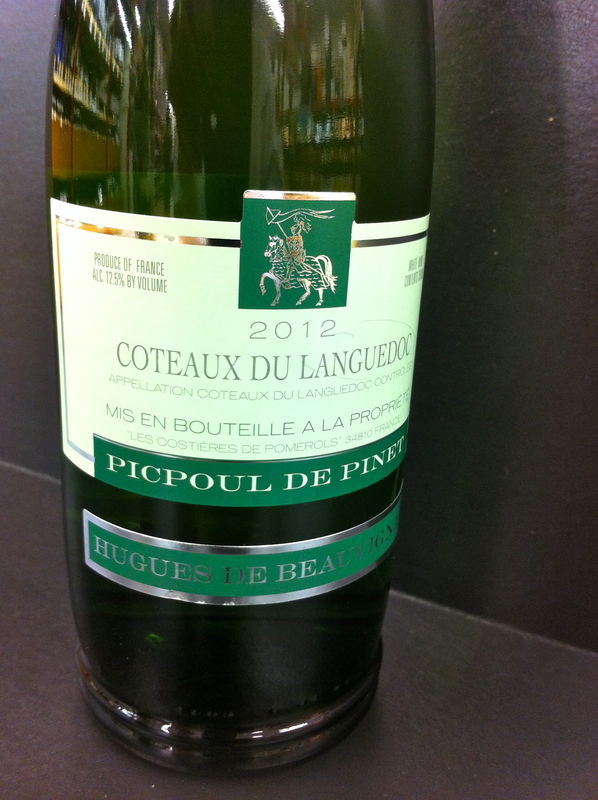 From Picpoul de Pinet, one of the top villages in the appellation of Coteaux du Languedoc in the south of France, the Hugues De Beauvignac Picpoul is a crisp and refreshing white wine with lots to offer. A light-bodied wine with an inviting nose, delicious citrus fruit flavors on the palate and nicely balanced acidity. A perfect wine for a porch-sipper or backyard get-together. Enjoy with a variety of seafood dishes, fresh green salads and grilled fish or chicken. Off the west coast of Italy and south of the island of Corsica is the island region of Sardinia (Sardegna). Sardinia is the second largest island in the Mediterranean Sea where the grape variety Vermentino is widely grown. 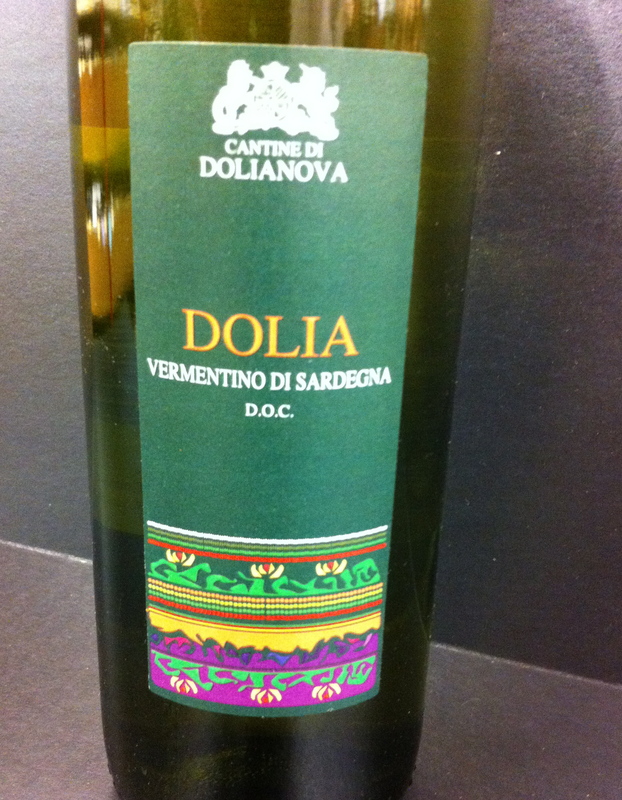 Made from the Vermentino grape, this lovely white wine has a very floral nose with crisp citrus fruit flavors on the palate. Balanced acidity and a refreshing finish complete the wine. Serve with seafood dishes, grilled fish and garden fresh green salads. Located in north-central Spain, northwest of the capital city of Madrid, is the wine region of Rueda. This region is known for high quality white wines made from the grape varietal Verdejo. 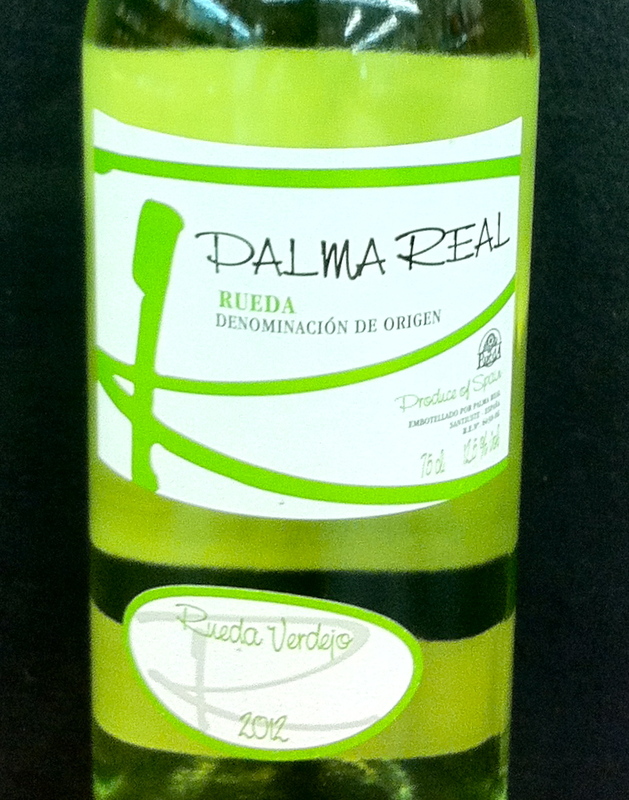 The Palma Real Rueda Verdejo is a delightful example of wine from the region. If you’re a Sauvignon Blanc fan like I am, you will appreciate the flavor profile of this wine. Fresh and clean on the palate, with tropical fruit flavors, crisp acidity and pleasant mouthfeel. This is a light-bodied and refreshing wine with mineral notes and a lingering finish. Enjoy with shrimp tacos, grilled fish and light pasta salads. It is well documented in trade publications that Grüner Veltliner has become a go-to white wine for sommeliers and wine and food pairing enthusiasts. Grüner Veltliner is another alternative to Chardonnay and can offer a distinctive spiciness and complexity. 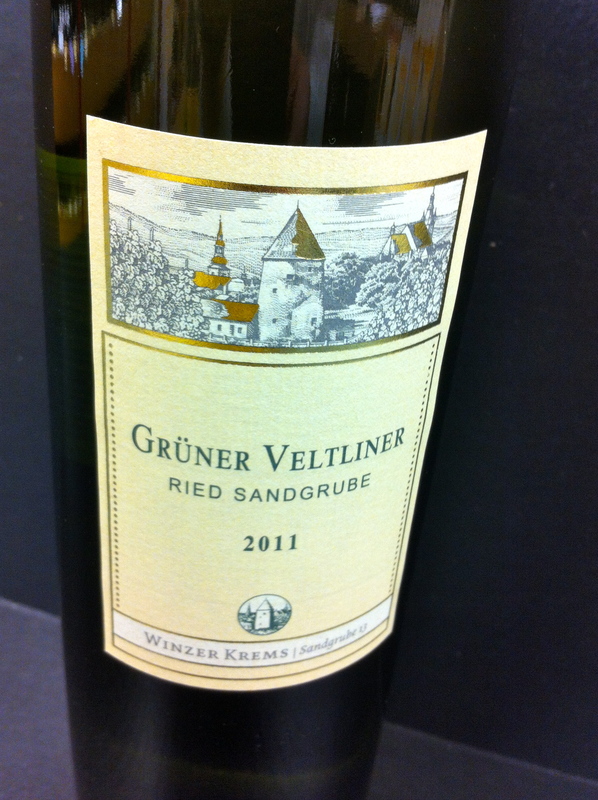 A great way to explore the signature grape of Austria is with the Winzer Krems Grüner Veltliner 2011. The wine, with its citrus fruit and floral nose, has interesting complexity and stone fruit flavors on the palate. It is medium-bodied with notes of spice on the finish. Enjoy with lobster tails, cream-based pasta dishes and Asian-fusion cuisine. Our final stop on this summer whites tour is on the Greek island of Santorini. Greece is the original wine-producing country in Europe, and one of the oldest wine-producing regions in the world. One of the three major white wine grapes of Greece, and the grape used in this featured wine, is Assyrtiko (Ah seer’ tee ko). Assyritko is an indigenous grape varietal and is widely planted in the volcanic soil of Santorini. The two other major white wine grapes are Moschofilero (Mos ko fee’ le ro) and Roditis (Ro gee’ tees). Best served with Mediterranean cuisine, the GWC Assyntiko is an elegant wine with crisp clean fruit flavors on the palate and pleasant acidity. The wine has an interesting minerality to it and a palate cleansing finish. 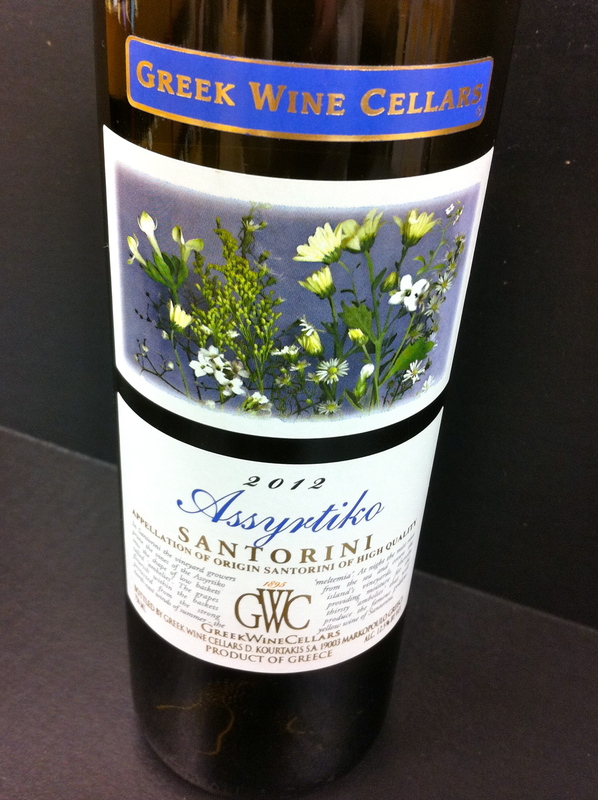 The GWC Assyrtiko is nice introduction to the wines of Greece. Up bright and early, we headed to our first stop at Beaucanon Estate. The de Coninck family has a long winemaking history in Bordeaux, they own the St Émilion Grand Cru Classé estate Château Canon. In essence, Beaucanon is the family’s Napa outpost located in the southwestern part of Napa Valley. Every time I taste their wines I’m impressed – dollar for dollar the Merlot, Cabernet Franc, and Cabernet Sauvignon are best-in-class. We enjoyed a sunny stroll through their vineyards, tasted some wines in their garden with proprietor Louis de Coninck, it was an excellent way to start our day! Then it was a short drive to Monticello Vineyards which is located in Napa Valley’s Oak Knoll District, a family owned winery since its inception. 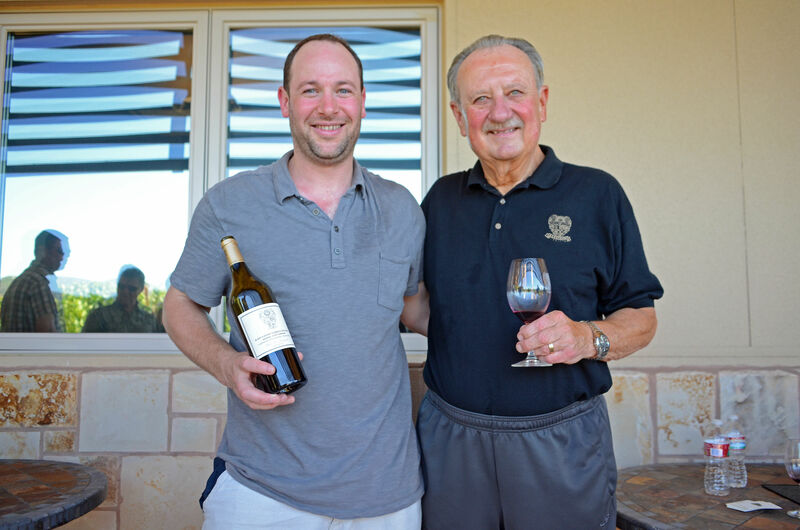 Founder Jay Corley and his two sons were on hand to greet and take us through their wines. In the 1960’s Jay lived in Virginia and became fascinated with Thomas Jefferson and his passion for wine, so when Jay had the chance to purchase some vineyards in Napa Valley, he jumped at the opportunity and built a replica of Thomas Jefferson’s house in Charlottesville, Virginia, aka., Monticello. 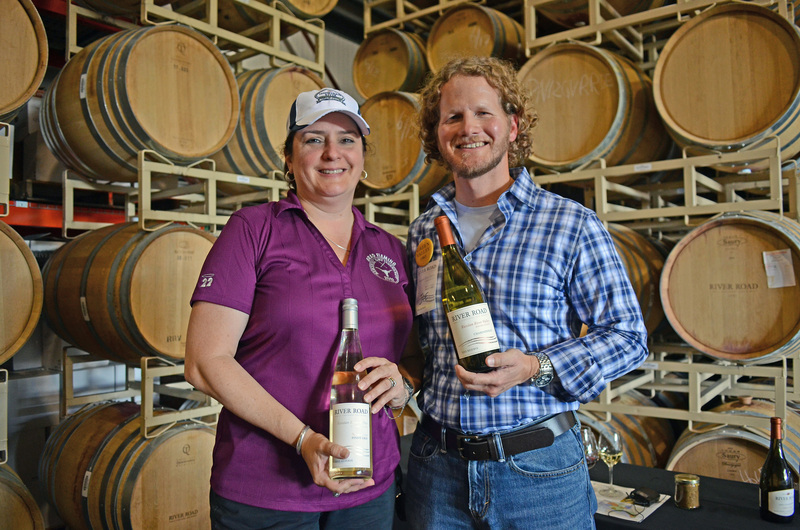 Under the shade of umbrellas, the Corley family explained their farming and winemaking philosophies and the style they strive to achieve in their wines. To cap the visit, Jay Corley donned a colonial style coat and a powdered wig to take some pictures with the team! It was then off to lunch with two of our most important winery partners – Rutherford Ranch Winery and Arroyo Secco Vineyards. These folks are the teams behind the Muirwood and Dominican Oaks brands, two of our top selling customer favorites. The team took us through their newest releases, including Cuboid out of a box, which was fun! They provided an incredible lineup of food; succulent heirloom tomatoes and local burrata cheese, deviled eggs, grilled steak and chicken, all were all delicious. The rest of the afternoon was packed with visits to some of the most elite wineries in Napa Valley. These intensely passionate producers are protective of every cluster, every grape, from budding to bottling. Nothing but perfection is allowed in these wineries. The production areas are impeccably clean, fermentation tanks are custom-made for specific blocks in the vineyard, and they have sorting tables that require up to 20 people to separate every grape and remove every stem jack painstakingly by hand. A stop to see Lou and Louis Kapcsándy was first on the list. 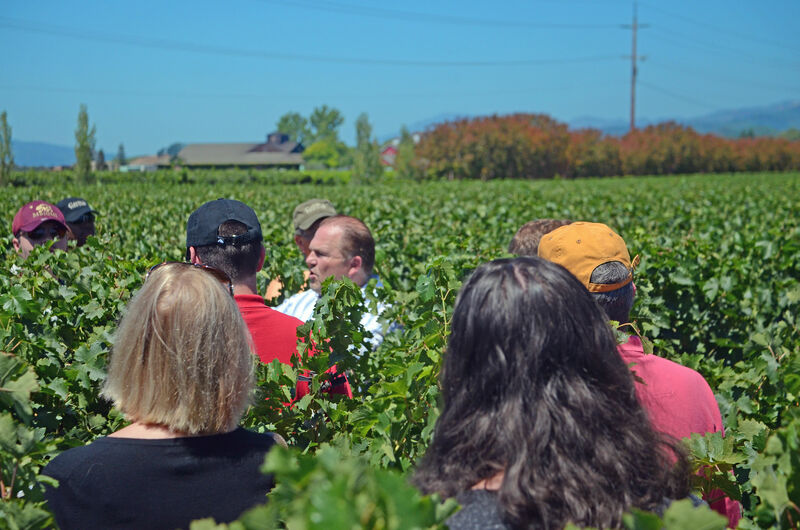 Lou took our team through the vineyards while explaining his winemaking philosophy – Lou is a firm believer that if you don’t get outstanding grapes, you can’t make top quality wine. He poured his rosé first for us, then the Endre (his second label) and then the Grand Vin 2009. The Endre Cabernet was superb – something that you can drink now while the Grand Vin ages (although it’s super tasty now too!). The winery was immaculate, Lou is a perfectionist and it shows in his wines. Next, the group split into two, with one headed to ROY Estate and the other headed to Blankiet Estate – since I had tasted the ROY wines on Monday, I elected to be on the bus to Blankiet. I have been a huge fan of Claude Blanket’s wines for years, even before I started with Total Wine & More I was purchasing his wines off his mailing list. Nestled on the western hills of the town of Yountville. Right behind Dominus Winery, owners Claude and Catherine greeted us, sharing the story of how they started Blankiet. They took us to the top of the hill behind the winery to show us how differing soils, sun exposure and canopy management are important for each site and grape variety. Back down at the winery in the fermentation room, we tasted through their three wines, the Prince of Hearts, Rive Droite (Right Bank) and Paradise Hills Proprietary Red. 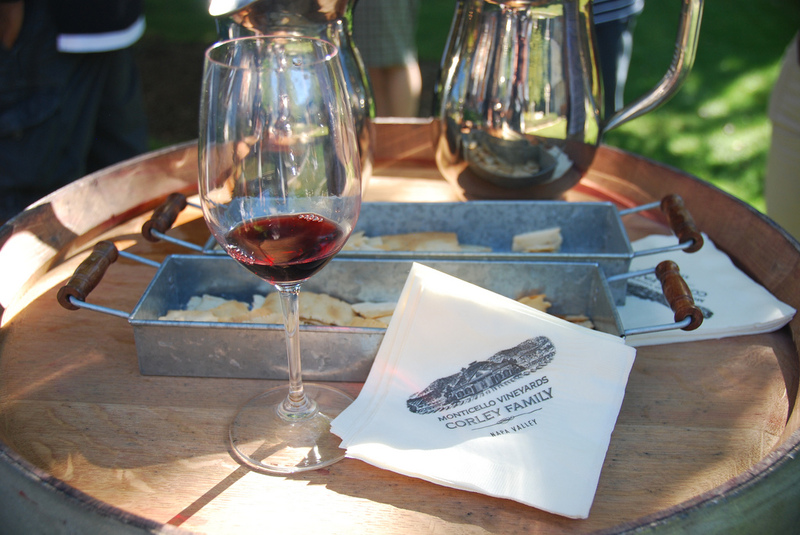 The 2006 Paradise Hills Proprietary Red was stunning, featuring rich notes of forest floor, well integrated oak flavors/aromas and dark cherries and espresso aromas – you can drink the Proprietary Red now or age it for at least 20 years more. What amazing people and amazing wine, Claude and Catherine were truly gracious hosts, I can’t wait for my next trip back here. The last stop of the day (which last year featured the most amazing lunch we had the entire trip) was down to Coombsville with Larry and Mary Anne Tsai – proprietors of Moone Tsai. They greeted us with a glass of Sonoma Coast Chardonnay and some delicious hors d’ oeuvres – Niman Ranch bacon fritters, soufflé Gruyère cheese puffs, and grilled Point Reyes oysters with sweet Thai flavors. Those Gruyère cheese puffs were perfectly paired with the Chardonnay. After a quick tour of the caves we sat down for dinner where each course paired with one of Moone Tsai’s wines – their Napa Valley Chardonnay, Howell Mountain Red, Napa Valley Cabernet and Cor Leonis Cabernet were all served. The boneless sterling short ribs with buttermilk mashed potatoes were delicious, and a perfect pairing with the Napa Valley Cabernet. Larry and Marry Anne Tsai were tremendous hosts as always and provided the best meal of the week so far – Thank you, Mary Ann and Larry! 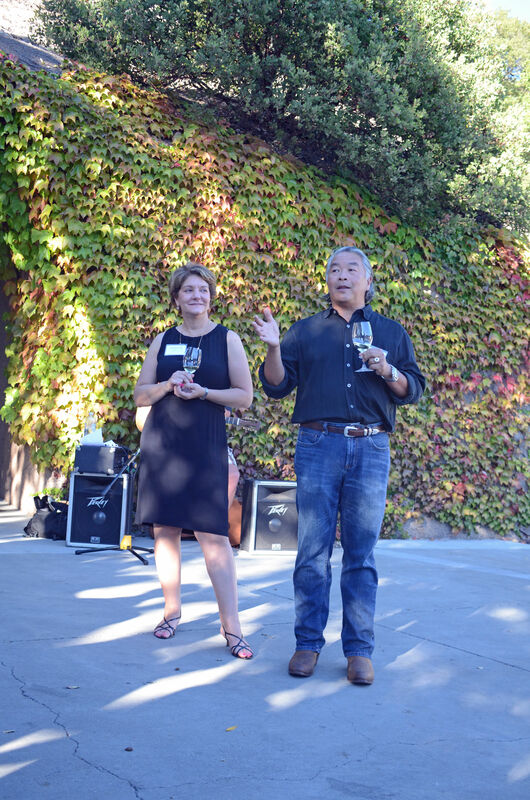 Well, that was another memorable day in wine country, and another amazing lineup of producers! Today begins the first of three days in Napa! First on our agenda is driving up Spring Mountain to visit two producers. Because the wineries are so small, we had to split into two groups. 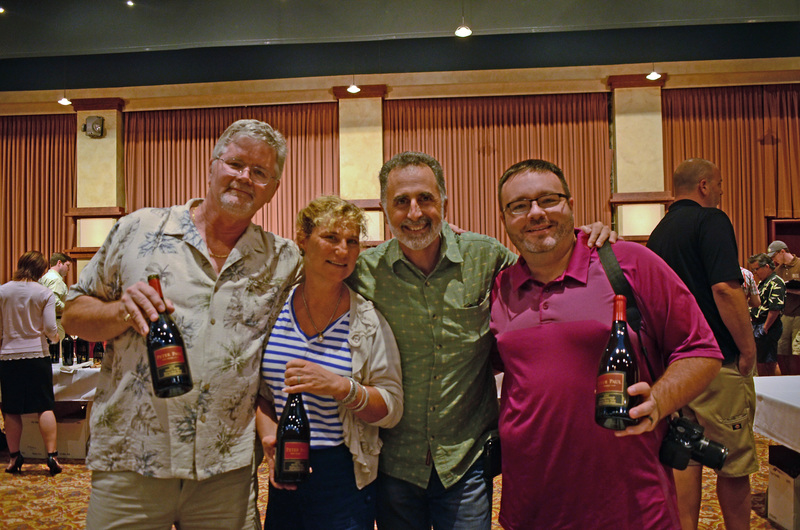 My group visited one of my absolute favorite producers, Philip Togni. He has been making wine in the Napa Valley for over 40 years, and in the early 80’s he planted vines of his own on Spring Mountain. 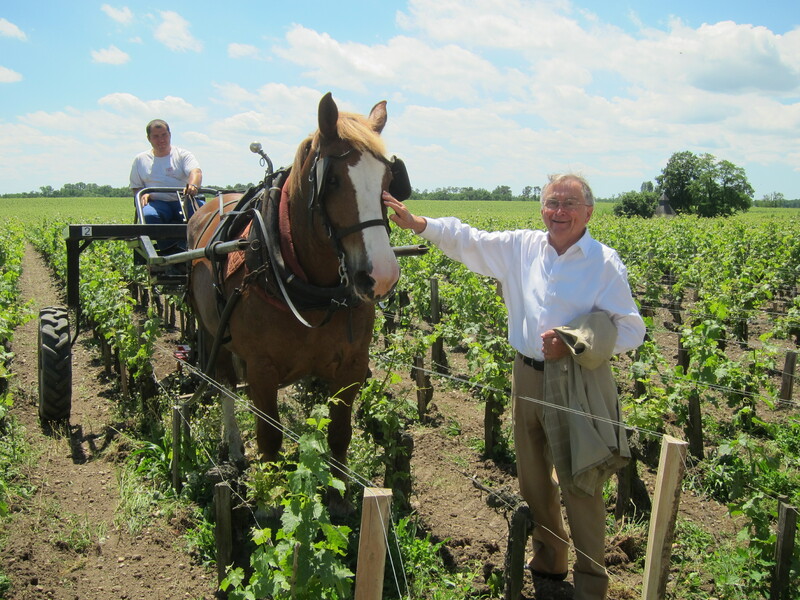 Today, he, his wife Birgitta and his daughter Lisa, manage a small plot of land where they produce two Bordeaux varietal based wines and one dessert wine. There is no sign indicating the winery from the road, no tasting room, and no place in the valley to taste their wines so this visit is a special and exclusive treat! I first tasted Togni’s wines in 2000, when I lived in Napa Valley and was working at Dean & Deluca where my wine team got a bunch his wines from the 1980’s. It was my true first experience tasting mature aged wines, one I will never forget. These wines are proven to withstand the test of time, and today Philip shared the 2011 vintage in barrel and both the 2005 and 2008. I cannot pick a favorite, they are all equally amazing. Thank you Brigitta, Lisa and Philip for hosting us! 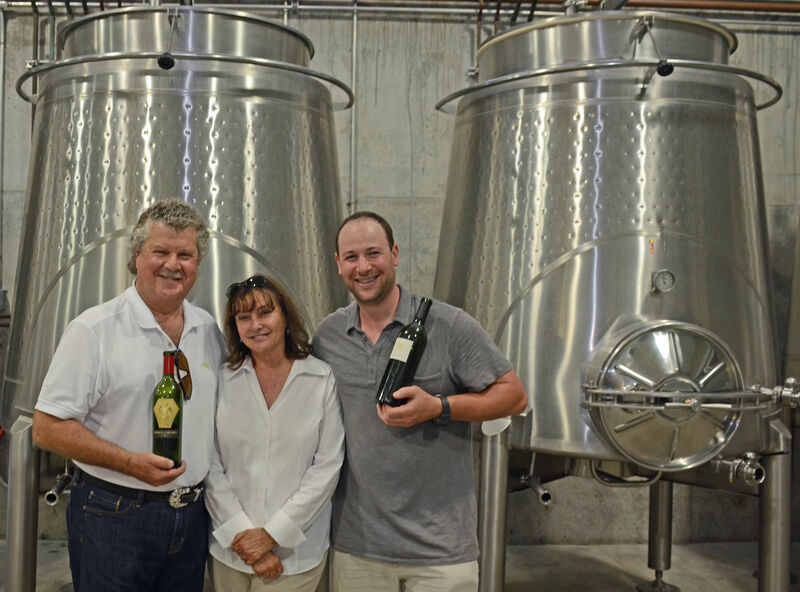 Next was Barnett Vineyards – hosted by owner Fiona and Roy Barnett along with their winemaker, David Tate. 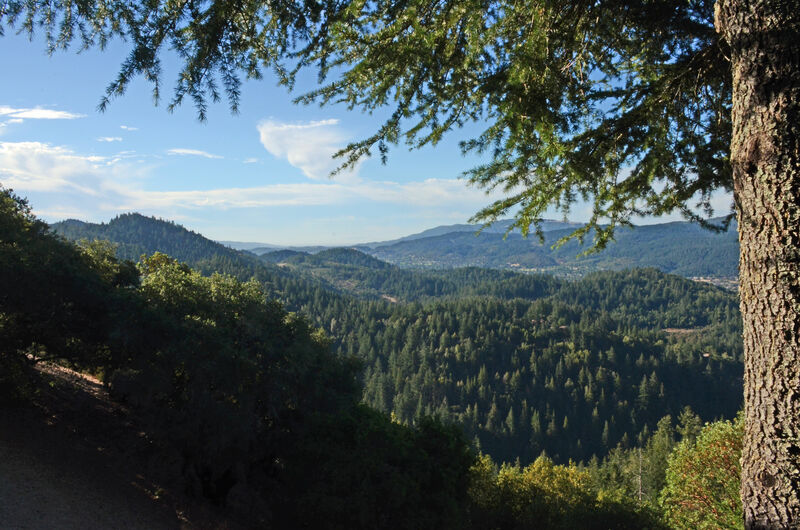 The property features a stunning view of the valley, I can’t imagine waking up to these views every day! The Barnetts are super-organized, we were escorted into the caves where the three of them had tables set up classroom-style for our team to really focus on the wines and take good notes. We tasted two Chardonnays, three Pinot Noirs, a Merlot, their famous Cabernet Sauvignon and the legendary Rattlesnake Cabernet were all open for us to taste. I was really impressed with these wines, there definitely will be a few of both Cabs going into my cellar and some of those tasty Pinots for enjoyment over the rest of the summer. From left: Joe Wagner, Cyrus Hazzard, Chuck and Jenny Wagner. Cabernet grapes, hosted by Chuck. It was a bit warm out there, but not to worry, once we were finished The Wagners refreshed us with a crisp glass of Emmolo Sauvignon Blanc and then took us into the cool caves for an amazing lunch and tasting with Chuck and Joe. We tasted Mer Soleil Silver, Mer Soleil, Meomi Pinot Noir, Belle Glos Dairyman Pinot Noir and the upcoming release of the 2011 Caymus Vineyard Special Select Cabernet Sauvignon and as a special treat, their 2003 Special Select. A big thank you to the Wagner family hosting us! 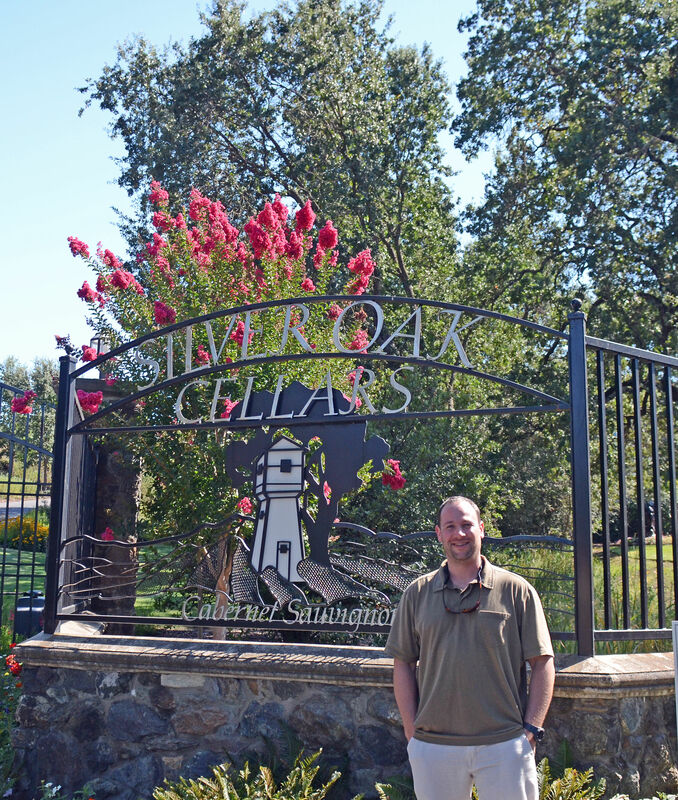 A quick jaunt up the road to St Helena took us to Rich Salvestrin, owner and winemaker at Salvestrin Winery. There’s a cool story here, the Salvestrins actually own the property that the Dr. Crane (of the famous Beckstoffer Dr. Crane vineyard fame) lived on and includes some of his original vineyards. The Salvestrin Sauvignon Blanc was bright and refreshing and their Cabernet Sauvignon was silky and elegant. From there, we headed down to Whitehall Lane Winery and then up the Mayacamas Mountains to Long Meadow Ranch. Long Meadow Ranch is a very interesting property, it’s not only a winery, but they have olive orchards including a stone wheel oil press for producing olive oil from those orchards. Here was another amazing view of the valley, overlooking the small town of Rutherford, with views of St. Helena and Oakville. Long Meadow Ranch also owns the restaurant Farmstead in St. Helena, which features delicious farm-to-table cuisine where they showcase as much as possible from their ranches on the menu. The last stop of the day was at Amici Cellars located just off Old Toll Road near Calistoga. After last year’s visit, Amici set the bar very high! As expected, they were up to the challenge, greeting us at the winery with their Sauvignon Blanc (there seems to be a lot of great ones today!) and a tasting of their new releases of Olema Chardonnay, Cabernet Sauvignon and No Curfew Red Wine. After the tasting, we walked down to a beautiful clearing to taste through the entire line of Amici wines – and like last year, the Morisoli Vineyard Cabernet was a stunner! Sadly, there’s not a whole lot of this around but if you really want to treat yourself, this one is the one to get. They also introduced us to the newest addition to the Amici family of wines – the Amici Reserve Cabernet which will be available soon at your local Total Wine & More, it was spectacular! As if the tasting wasn’t a good enough, we were treated to Gott’s Roadside for dinner – for those of you that have visited the Napa Valley, you would remember it as Taylor’s Refresher, definitely the best burger in town! As we watched the reflection of the sunset off of the beautiful Palisades mountain range, the night came to a close. Tomorrow the agenda is packed again, this time with some of the biggest hitters in the Napa Valley, stay tuned! Check out more of my photos from the trip here! Day three of our California Wine Experience is all about Sonoma, the idyllic home of Pinot Noir and Chardonnay in California. Ever since the movie Sideways, Pinot Noir has been on fire, with no indication that its popularity will be slowing down anytime soon. Our first stop was at DeLoach Vineyards nestled in the picturesque Russian River Valley of Sonoma. DeLoach Vineyards is now owned by the Boisset family – some of you might know a few of their other wines, like their popular (and delicious!) Louis Bouillot sparkling lineup from Burgundy. DeLoach is a very interesting property, they’re true believers in biodynamic farming. For those that don’t know what biodynamic production means, it’s all about taking good care of the land and using what the soil provides you in order to grow great grapes. Several top chateaus in Bordeaux have been using biodynamic vineyard practices for years; one great example is Château Pontet-Canet. Biodynamic practices stipulate that you can’t use tractors to plow, instead you use horses – you make all your own compost to provide nutrients for your vines, you even do your own vineyard work according to the cycles of the moon. DeLoach Winery also make the popular labels Sonoma Cuvee and Seven Peaks lines for us. Thank you, DeLoach for an amazing educational visit! Next up was Martin Ray Winery, also located in the beautiful Sonoma Russian River Valley. Courtney Benham, proprietor of Martin Ray Winery, was on hand to greet us for our visit. I always look forward to seeing Courtney, he never fails to have something fun in store for us. This year it was a blind tasting of five of his Cabernets. Blind tastings are always tough – our elite TWP’s (certified Total Wine Professionals) were asked to be our representatives in this challenge. Blind tastings have always been a humbling experience for me in the past; our TWP’s had to taste all five wines and determine the appellation or sub-appellation they came from. The winner identified three of the five, which to me is impressive! Like last year’s visit, we weren’t able to make a stop at a cooperage (barrel maker), so Courtney (of course) brought one to us! The team was able to see him assemble a barrel from scratch using individual staves – pretty amazing stuff – water, fire and the barrel maker’s will used to bend the staves into shape. So, now I have one question for our readers – California rosé wine, is it something you’d like to see more of? Martin Ray Winery shared with us a new rosé of Pinot Noir that I thought was delicious. Who’s in? Tell us in the comments. 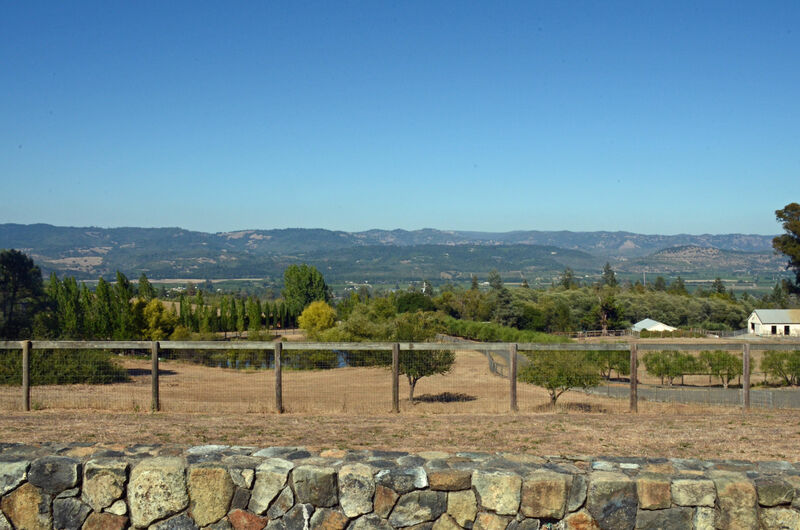 Next stop, Alexander Valley –to Silver Oak Winery and Twomey Cellars! Silver Oak makes one of the most famous Cabernets produced in the U.S .today and is still family-owned, and boy, they put on a great tasting! 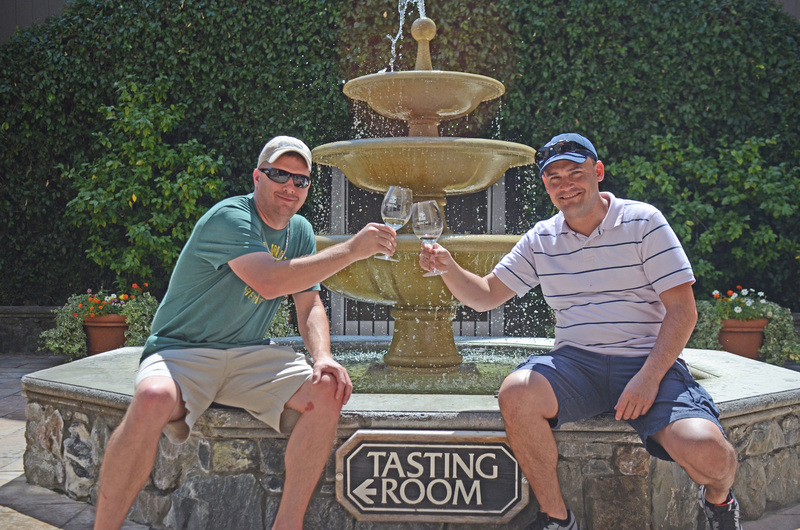 The Silver Oak team welcomed us with a glass of Twomey Cellars Sauvignon Blanc, quite refreshing on a hot afternoon! We got to meet both the winemaker for Twomey and the assistant winemaker for Silver Oak. 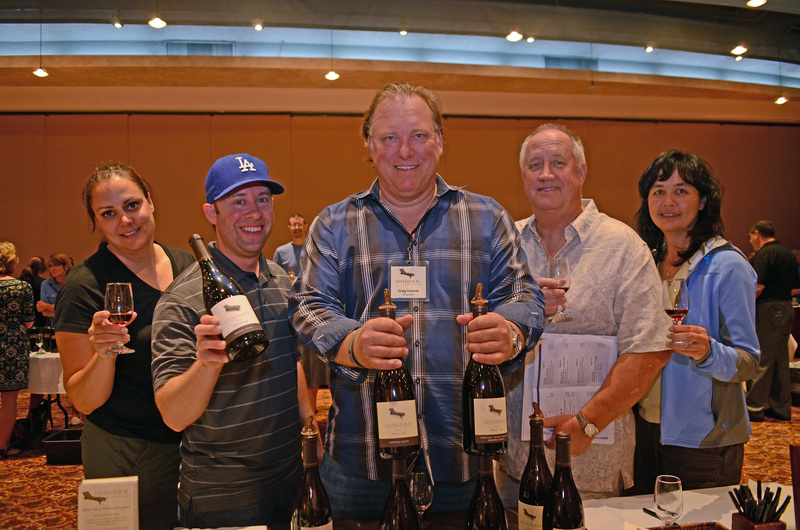 We had the opportunity to taste four different Pinot Noirs from different regions in California – Anderson Valley, Sonoma Coast, Russian River Valley and from the Bien Nacido vineyard, located in the Santa Maria Valley of the Central Coast of California. They were outstanding wines, all great examples of their locations – it’s amazing how different region’s wines truly do taste unique even though they are all made from the same grape variety. Next, we were off to Sonoma’s Dry Creek Valley to visit Fritz Winery’s underground property. Today, Fritz was not only showcasing their own wines, they were gracious enough to allow some of our other local Winery Direct® partners to show off their wines as well. The lineup was Fritz Winery, Jenner Vineyards, Lost Canyon Winery, Kachina Vineyards, Bella Vineyards, and Puccioni Vineyards. 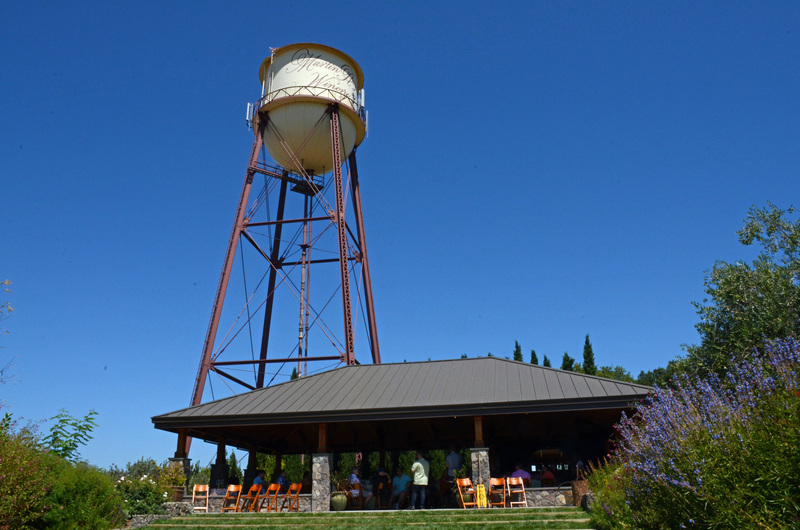 The Fritz Winery is located in Dry Creek Valley, situated in Sonoma’s northern end. 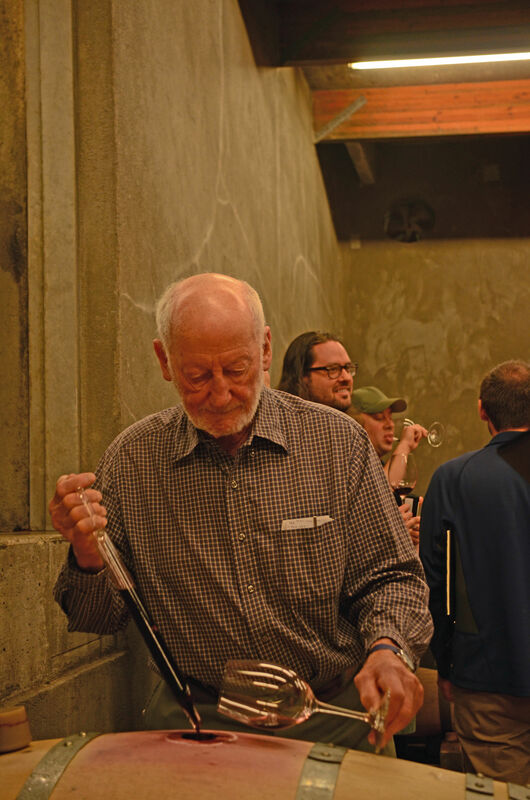 The winery utilizes gravity flow technology, where they start their wine production on the top of the mountain, which then feeds into the fermentation tank room and then down another level into the aging caves, all driven solely by gravity power, eliminating the need for mechanical pumps which can have a deleterious effect on the wine. Our team split into smaller groups and we got to stop and meet the owners individually and taste their wines. We can’t possibly pick a top wine of the tasting, they were all excellent – from crisp Sauvignon Blancs and Chardonnays, to big robust Zins and Cabernets from Dry Creek Valley, there wasn’t a bad wine to be found! Our last stop of the day was at Dry Creek’s Truett-Hurst Winery. CEO/Co-founder Phil Hurst was our host for the evening. As we entered, everyone in the tasting room welcomed us with mustaches … in celebration of their Fugitive line of wine, which sometimes gets confused with The Prisoner! 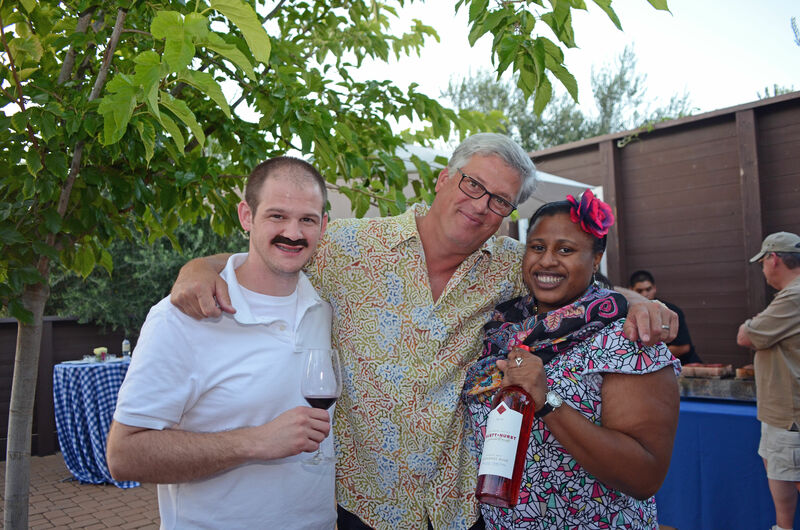 As the team donned our mustaches we were handed a glass of their Salmon Run rosé, and let me tell you, that is just what the doctor ordered on a hot summer afternoon in the heart of Dry Creek! There is some really cool stuff going on here, Truett-Hurst is actually the first winery in over 13 years to successfully offer an IPO for a winery on the NASDAQ. Aside from that, they make some fantastic wines including the popular Harbor Front and The Fugitive line. They have something else really cool coming up soon; I can’t tell you right now what it is but it’s going to put what you think about wine on its side! This is our last day in Sonoma, tomorrow starts the Napa Valley side! California Wine Experience: Day One is here. It’s 8:00 a.m., and the team is on the bus and headed for wine country! First stop is Ceja Vineyards, located in the Carneros region of Sonoma. For those that are not familiar with Carneros it’s actually called Los Carneros, or “the Rams” and is an AVA (American Viticultural Area) that straddles both Napa and Sonoma. Owner and co-founder Amelia Ceja was the first to greet us – and let me tell you, this is one of the most passionate wine personalities I’ve ever met! 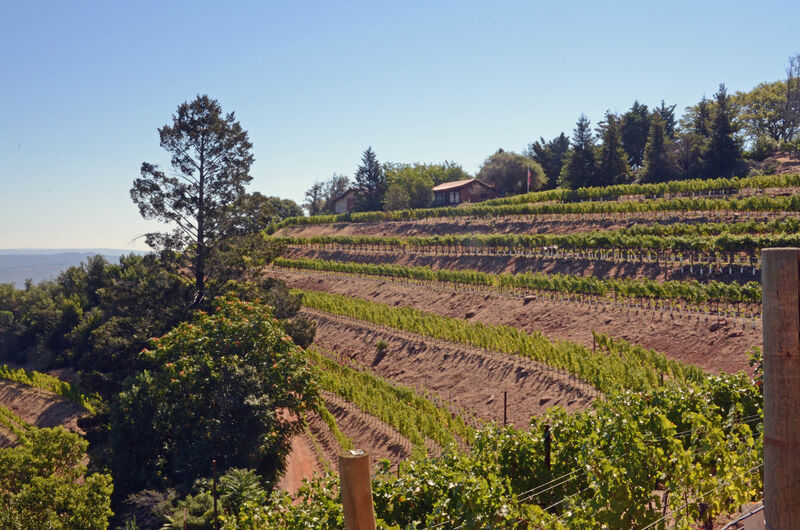 The family has an incredible story; the Cejas were originally harvest workers that made it to the big show – producing some of the best examples of Pinot Noir and Chardonnay in California. My favorite of the visit was their Pinot Noir, full of mouth-watering acidity and gorgeous fruit flavors, all about finesse and elegance. Sadly, we had to keep to our schedule which if it was up to Amelia; she would have had us for the entire day to herself. Next up, Kunde Family Estate. Running just a tad behind we turned into the Kunde estate where we were greeted by Owner, Jeff Kunde and his winemaker, Zach Long. With no time to spare they each jumped onto a bus and we headed up the mountain to get a better view of the property. The Kundes have been growing grapes and making wine for over 100 years and are the largest land owners of planted vines in Sonoma Valley. They also make our Kinneybrook line, which is actually where the Kunde Winery is located. The Kinneybrook Ranch … and of course there was a brook running through the property – so hence the name Kinneybrook. All the grapes for those wines come from that piece of the property. There are amazing views from the Kinneybrook vista point, not to mention outstanding wines. We tasted through the entire lineup of Kinneybrook for the upcoming releases with not a bad wine in the lineup! Lunch was served in the shade of trees and then we headed back on the bus to Green Valley for a visit to River Road Winery, one of our best winery direct partners. Welcoming us with a glass of rosé, the team of River Road was all there to say hello. Boy, did they pull out the all the stops! 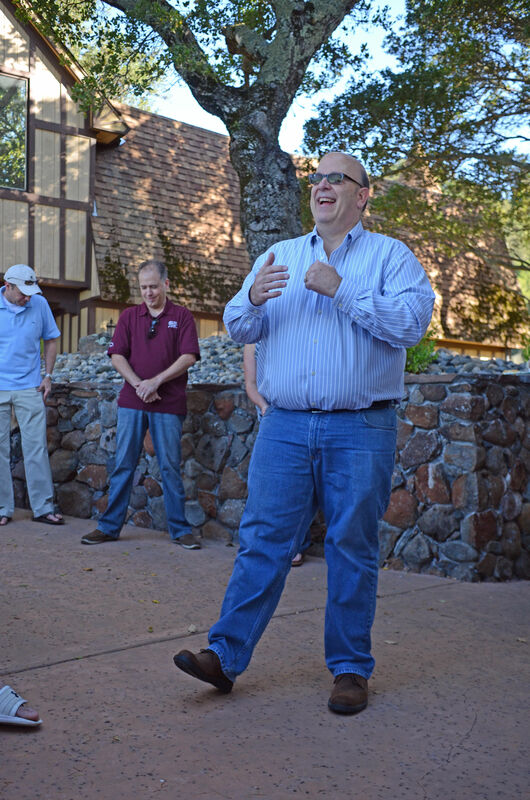 Owner Ron Rubin, winemaker Joe Freeman, assistant winemaker Ed Morris and several vineyard owners were in attendance including the Boschetti and Hopkins families – names you may know from River Road’s single vineyard Pinots and Chardonnays. In the winery they had tables set up for us to go through the most recent vintages of their wines. 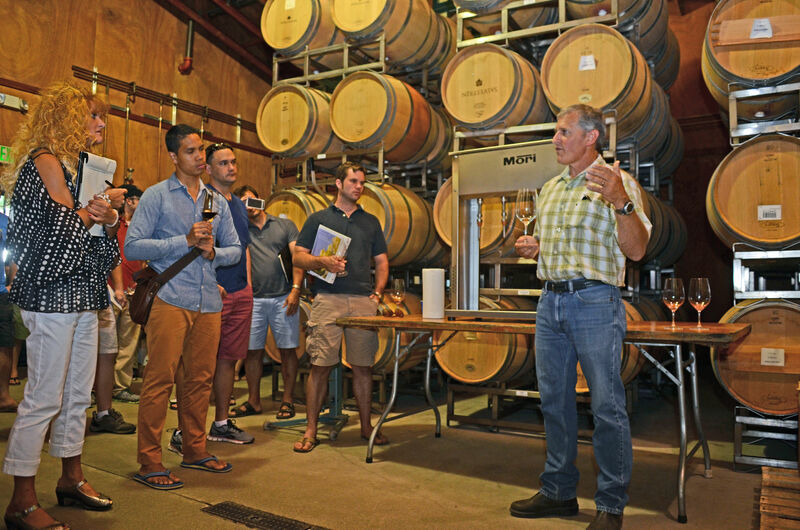 Winemaker Joe Freeman led the tasting, with support from his assistant Ed, who used to work for a cooperage and has extensive knowledge of how barrels are made and the effects they can have on wine. The group this year was really inquisitive; Joe had his hands full answering all of their questions. Because we had so many questions, we ran a little behind, sacrificing some dinner minutes to take advantage of the time we had with Joe and Ed. It’s not like they let us leave hungry though, the Hog Island oysters on the half shell and crab cakes they provided were delicious! As if that wasn’t enough for one day, we went back to the hotel where we had a meet and greet scheduled with 25 more producers. What an amazing tasting; each year this event keeps getting better and better. Each team member interviewed one producer and will be sharing their findings on the bus to their teammate in between winery visits over the next few days. Of course, once the interviews were over, we had the chance to walk the room and taste all the wines which came from Napa, Sonoma, Lodi, Amador County and the central coast. It was really hard to pick favorites, but a few of the highlights for me were the Peter Paul Wines, Sojourn Cellars Pinots, Black Cordon Vineyards Cabernet Sauvignon and of course, ROY Estate. Ah, it’s a lot to ponder, especially with my palate fatigue (this is tough work!). Time for me to put the glass down. More tomorrow! 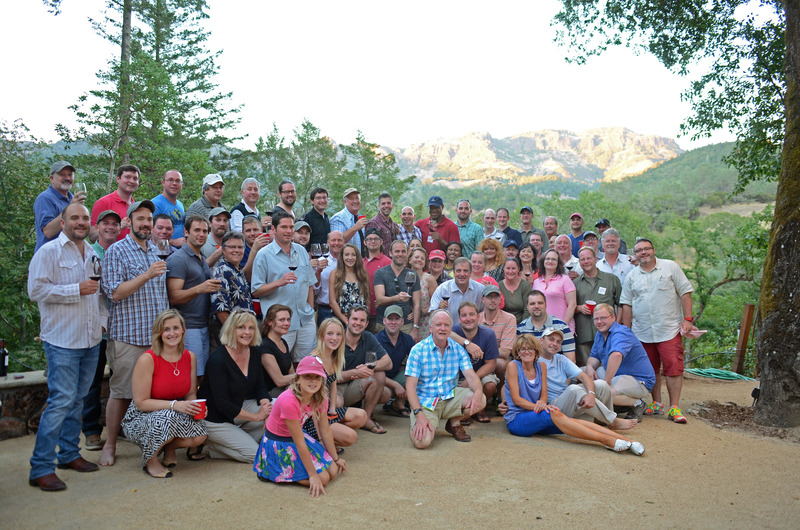 Each year, we send over 50 team members to California for seven days to enjoy an intensive and immersive experience in California visiting the premier wineries in the industry. My name is Cyrus Hazzard. I’ll be your guide over the next few days as we visit over 25 wineries and taste more than 400 wines (and a few beers too!). Our first day in California introduced a new experience for us; on previous trips we had never taken a day in San Francisco, plus we included a brewery tour — an exciting addition! Everyone landed around noon and headed to the hotel to get settled in. First up on our agenda, a few producers we couldn’t get to visit in-person were gracious enough to come to us for a tasting in our hotel. 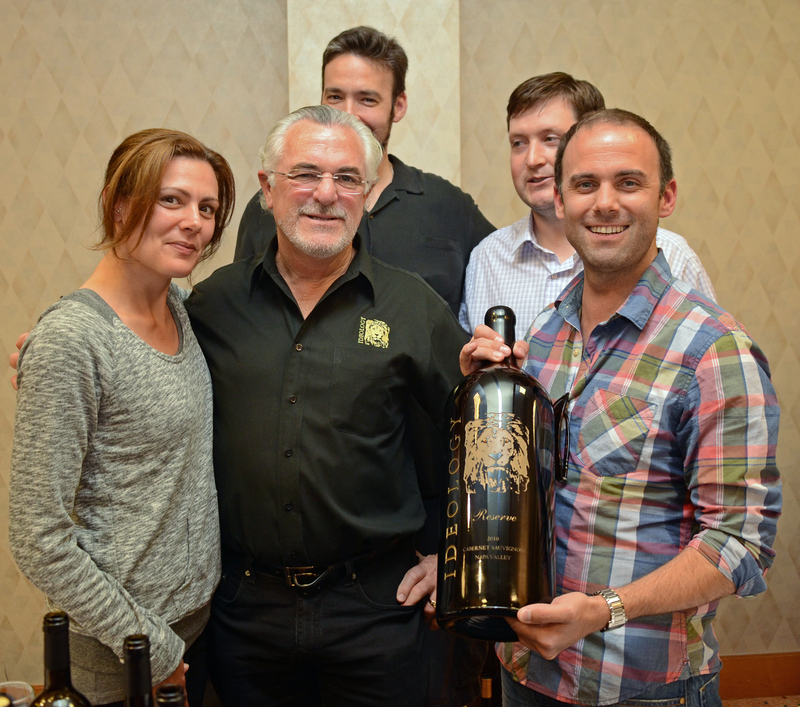 Testarossa, Dono dal Cielo and Ideology Cellars were on hand to share their wines and knowledge with the team. The wines didn’t disappoint, and neither did the owners, all of whom were on hand to personally share their stories and knowledge. Testarossa Winery was pouring two of their chardonnays and two pinot noirs, one of each are exclusives at Total Wine & More. The Cuvée 107 chardonnay is an excellent value along with the Cuvée 107 pinot noir. The wine for me that stole the show was their chardonnay from Santa Lucia Highlands, it displayed the perfect balance of fruit flavor and oak, this is one to definitely check out. Ideology Cellars was pouring their two chardonnays and several big reds, all of which never disappoint. Owner Bob Williamson has done an excellent job with this year’s lineup across the board. I’d be remiss in not mentioning Dono dal Cielo’s rich and delicious zinfandel. It’s amazing! After enjoying this first tasting, we embarked on a tour of San Francisco by bus and then to the big event of the day, a tour and tasting at Anchor Brewing and Distillery! We were allowed to start our tasting with any beer in the lineup we wanted, paired with sausage fresh off the barbeque. We then split up into two groups, one starting with the brewery and the other at the distillery. 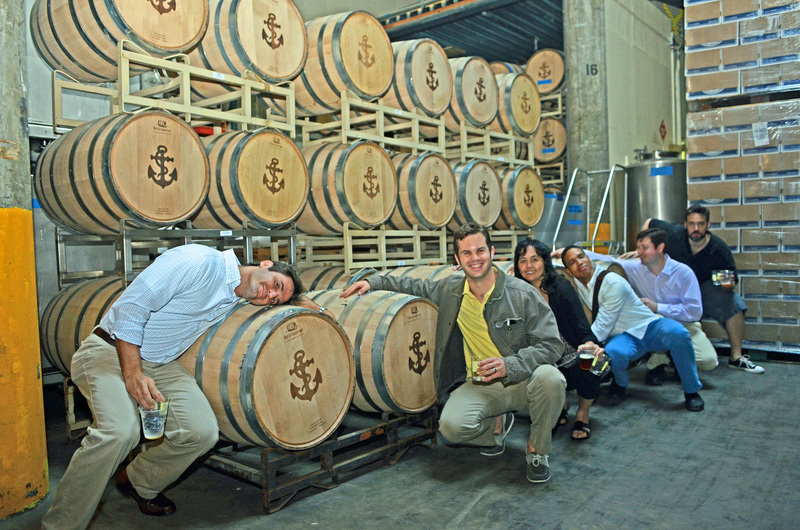 Having a blast in the Anchor spirits aging room! Something I didn’t know about Anchor was that they make some amazing spirits. They will be releasing Hophead vodka soon, it’s super smooth – and if you love IPA’s, this spirit is for you! Anchor’s staff is extremely knowledgeable and passionate about the products they make. A little known fact about Anchor Distilling is that they have partnered with the venerable Berry Bros. & Rudd in the UK (they bottle some of my favorite spirits) to bring their incredible rums, Cognacs and whiskies to the U.S. market. For an amazing sipping rum, you should check out the Berry Bros. & Rudd Guadalupe 12 year. The historic Anchor Steam brewery is amazing. They created one of the original steam beers and they were the only remaining steam brewery after Prohibition. 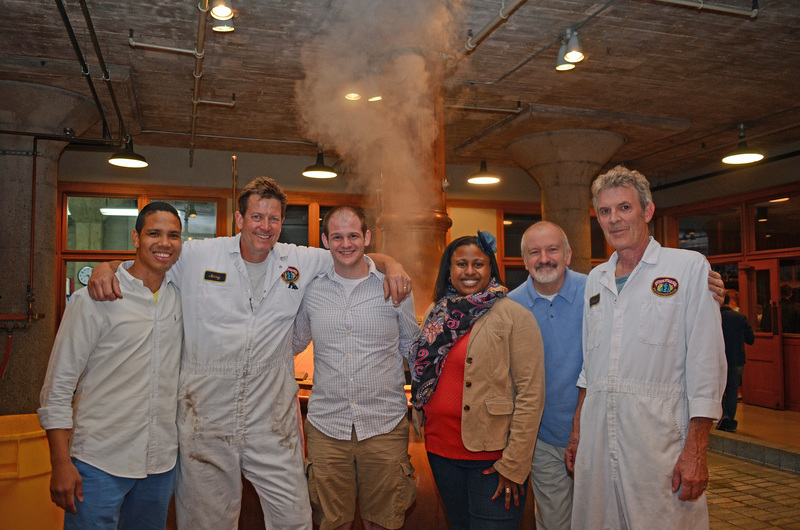 Our team got to observe the whole brewing process from start to finish with the experts that do it every day. One of the day’s highlights was learning about hops, the brewers at Anchor Steam use only whole-dried – which is unusual these days. To learn more about our friends at Anchor Steam Brewery, check out some of the videos we have on YouTube, they tell a bit of their story. A huge thank you to the team at Anchor! 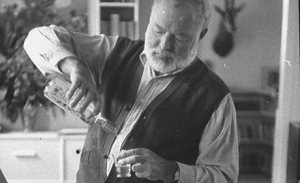 Ernest Hemingway famously said, “Write drunk; edit sober.” And who are we to argue with a legendary author known almost as much for drinking alcohol? To say Hemingway loved his cocktails would be a massive understatement. Being known for binge drinking is only the tip of things, too. Hemingway immortalized many cocktails in his books, spent time creating his own versions of several classics, and got behind many of his friends’ creations over his lifetime. 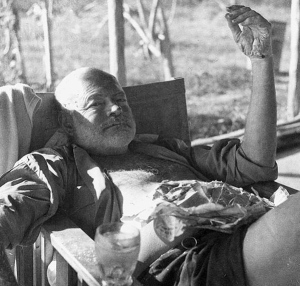 But what exactly was Hemingway drinking to get to that state of mind? Author Philip Greene has made a substantial effort to compile all drink references from Hemingway’s books and written his own about the subject. To Have and Have Another: A Hemingway Cocktail Companion talks about the cocktails in Hemingway’s life. Let’s explore a few interesting ones. As a regular at the El Floridita bar in Havana, Cuba in the early 1920s, Hemingway was rewarded for his patronage with a drink named after him. Bartender Constantino Ribalaigua created an upscale version of the Daiquiri known as the Hemingway Daiquiri (also known as the Papa Doble). This version included a recipe of white rum, maraschino liqueur, grapefruit juice and lime juice. Simple syrup is usually added though Hemingway was known to forgo the sweetness. He was also known to put more than a few away in a single visit! As noted, Hemingway was well known for making references to drinks he enjoyed in his books. The Jack Rose cocktail is an example made famous in his book The Sun Also Rises. Other favorite cocktails had connections to his friends — the Josie Russell, named after one of Hemingway’s friends from his Key West days. Josie was able to supply Hemingway with rum from Cuba during Prohibition and afterward opened one of his favorite hangouts called Sloppy Joe’s. While living in France, Hemingway’s friend named Gerald Murphy created the Bailey, which became a staple while living there. Hemingway enjoyed variations on the Cuba Libre and added Angostura bitters to the classic Gin and Tonic to liven it up. There are dozens of other cocktails consumed and written about: we found a great recap of many in this article. Do yourself a favor and try some of these Hemingway classics … in moderation. For day one of the “Bowtie Diaries” click here, for day two click here. Probably the most familiar quality classification of Bordeaux wines (and one that most people reference) is the Classification of 1855. The Classification of 1855 was requested by Napoleon III at the 1855 World’s Fair in Paris. The classification system ranked the wines according to a château’s reputation and trading price at the time. In total, 60 châteaus from the Left Bank were classified into five categories called growths or Crus, starting with the most prestigious, Premier Cru or First Growth, which was printed on their wine labels. Today, many people critique the Classification of 1855 for numerous reasons, such as not including châteaus from the Right Bank or not acknowledging that the vineyards’ ownership and conditions have changed since the classification. Nonetheless, the 60 chateaus that made this list of “Grand Cru Classé en 1855” are among some of the most highly regarded wine producers in the region. Today, we visited chateaus that were all a part of the 1855 classification, including Château Haut-Bages Libéral where we spent last night. of homemade croissant, assorted breads, cheese and fruit preserves. One (or two) croissant later we were off to Château Pontet-Canet in Pauillac, owned by Alfred Tesseron. Monsieur Tesseron comes from a family of esteemed Cognac blenders. Château Pontet-Canet prides itself on being 100% organic and biodynamic. They use all natural farming methods to ensure that they are producing Cabernet grapes exactly as the terrior (soil) requires. After touring their impeccable facilities and getting to feed the vineyard plow horses, we had an opportunity to taste the 2010 vintage that had received 100 points from the Wine Advocate. 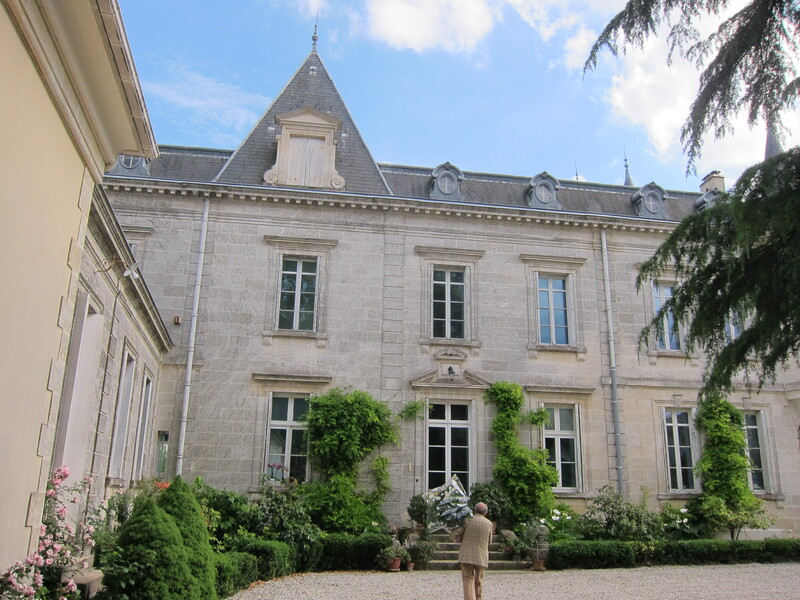 Wrapping up our tour of Pauillac, we headed south to Margaux, one of the largest communes in the Left Bank. The soil in Margaux is the thinnest of all the Left Bank communes, producing highly aromatic wines that are refined and well-balanced. We met Alexander van Beek, the General Director of Château Giscours and Château du Tertre, who told us that the wines of Margaux have the most beautiful fragrance, finesse and elegance, and he is right. 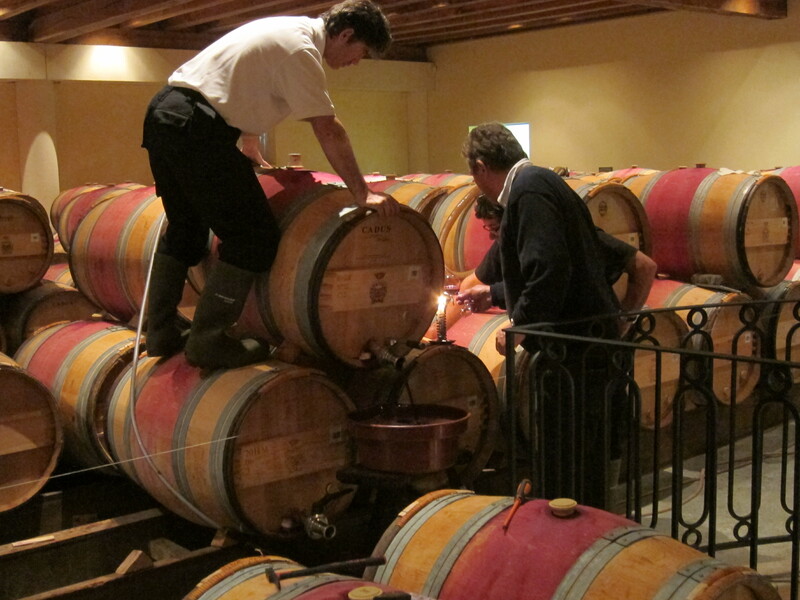 Recently, both Giscours and du Tertre have started using biodynamic farming techniques like at Château Pontet-Canet. 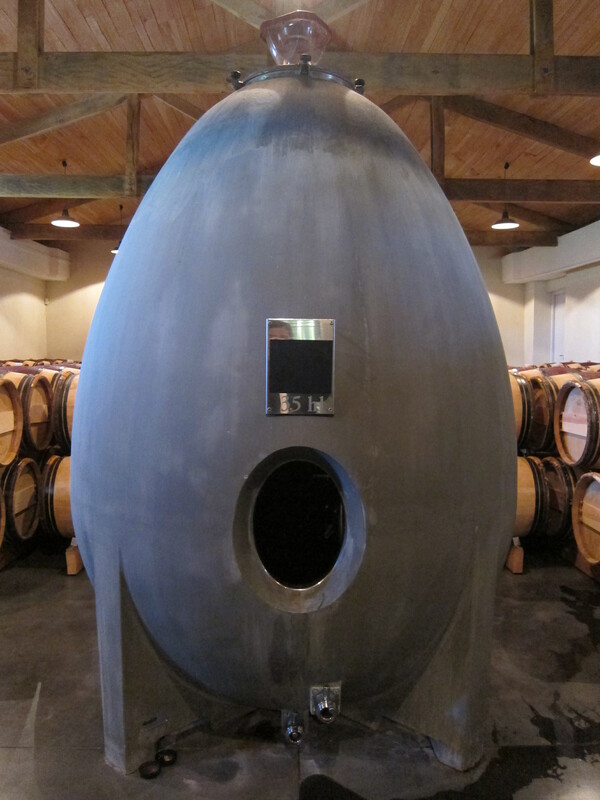 One of these techniques includes using an egg-shaped vat, which generates a natural movement of wine that in turn opens it up to provide more character. The egg vat was modeled after what was used in Mesopotamia, where the earliest origins of wine-making began. After a gorgeous poolside lunch at Château du Tertre, we headed back north to the smallest of communes on the Left Bank, Saint-Julien. Though Saint-Julien has no First Growth wines, there are numerous top growths from the 1855 Classification. One of these includes Château Gruaud Larose, where we got to see first-hand the process of soutirage, or racking of wine. Racking is a method of moving wine from one barrel to another to reduce sediment and clarify the wine. This process softens tannins and enhances the wine’s aromatic qualities. Today, there is equipment that filters out this sediment, but there are some producers in Bordeaux that use the original soutirage technique which, though very labor intensive, is believed to produce a higher quality of wine. This technique starts with opening the barrel and pouring the wine out into another barrel. As this occurs, the winemaker will take samples of wine in a wine glass and hold it up to a candle to check for sediment. 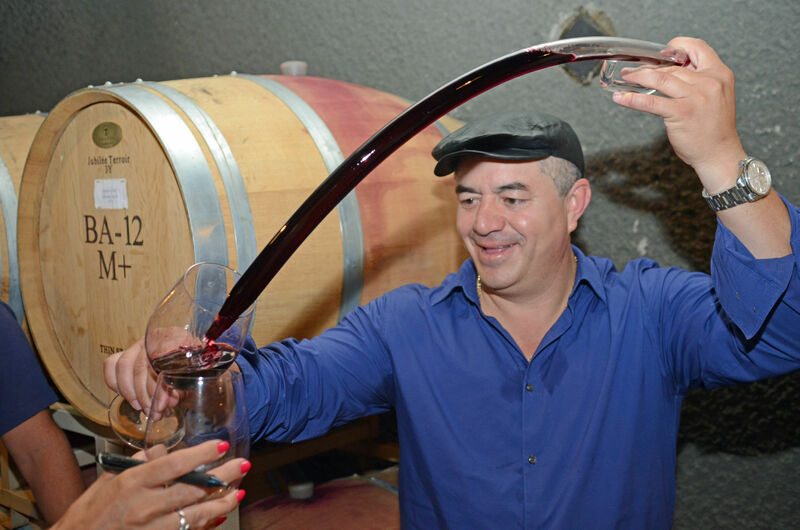 When the wine glass becomes full of sediment, the winemaker knows to stop pouring the wine into the new barrel and cap it, and to discard the current sediment from the wine. 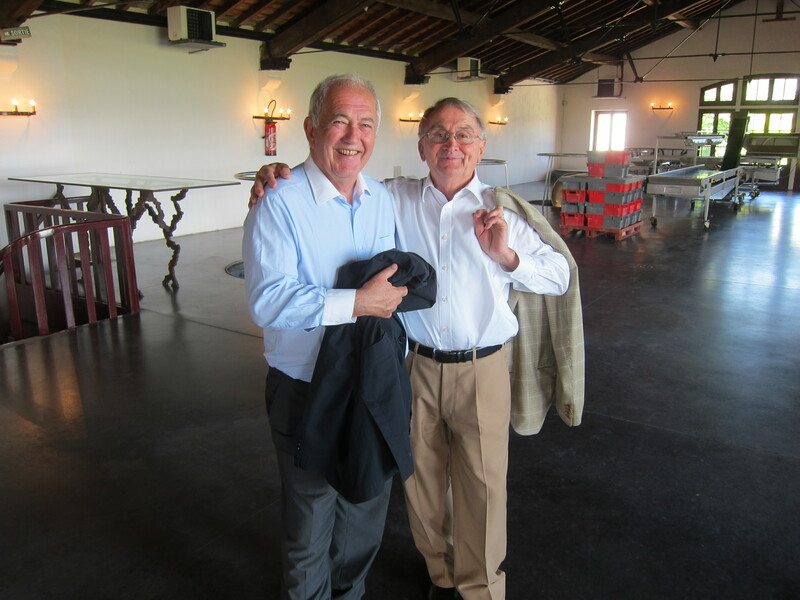 Finally, our time in Bordeaux and in the Left Bank wouldn’t be complete if we didn’t pay a visit to see Domaines Fabre and Château Lamothe-Cissac, home of former Total Wine & More intern, Jean-Hubert Fabre. Since Jean-Hubert left Total Wine & More as our intern, he has finished school and is starting his career in the wine industry. Château Lamothe-Cissac, where we met up with the Fabres, is in Haut-Médoc and surrounds the communes of Pauillac and Saint-Julien to the left, further in-land from the Gironde estuary. Jean-Hubert’s father, Vincent Fabre, who often travels to Total Wine & More stores along with California Zinfandel producer Paul Sobon to host exclusive tastings, produces wines from Château Lamothe-Cissac, Château Landat and Château La Tonnelle. However, Château Lamothe-Cissac is the flagship property of the Fabre family. Before stopping off at the Fabre’s, Alfio and I made a quick stop to a local florist to pick up some flowers for Madame Fabre, who prepared us dinner. It is here where we left Alfio toasting the end of his trip and another successful Bowtie Diaries with one of his favorite wines, Château Landat 2009. Thanks for following Alfio’s adventures! Next time you’re in your local Total Wine & More, check out the section named “Alfio Moriconi Selections” for many of the wines mentioned in these posts along with many others Alfio has hand-picked during his travels. You can also find some Alfio favorites on our website here.